Freejam, the team behind the hugely successful Robocraft, which has over 13 million players worldwide, sat down for a normal bleery Monday morning meeting about what next to do… and so Robocraft Royale, with its entertaining characters and unique destruction system, was conceived. By Wednesday it had a team of six working on it, and five months later it's here! The spontaneous rate of development has been incredibly exciting as player feedback during the past month is with implementation during regular Alpha Tests. Robocraft Royale. Is a new standalone PC game and about to launch on Steam Early Access on March 26th. Priced at 19.99, Robocraft Royale innovates the battle royale genre by allowing players to battle in a vast, 64km map with the best crazy characters sourced from the 13 million strong Robocraft community. 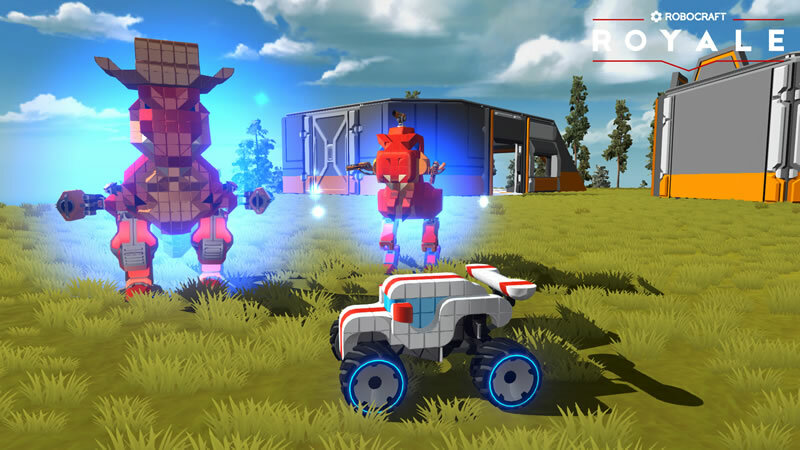 Robocraft Royale puts players straight into battle, experimenting with different character types, its brilliant cube destruction system bring players novel battle encounters as they de-gun their enemies, blast off their limbs, cripple their movement parts and totally manipulate their destruction. Robocraft Royale also offers endless surprises, with a changing roster of new characters to discover, events, contests, map updates and team modes keeping players coming back for more. While a spaceship streaks across a huge map, players eject and control their descent to the surface. Each character posesses bespoke weapon loadouts, abilities and may also walk, drive, hover and fly. Those who can master and be flexible with these different characters will survive the ever shrinking play area. By learning these strengths and weaknesses, even a mechanised chicken can emerge victorious! It's just a lot of fun!